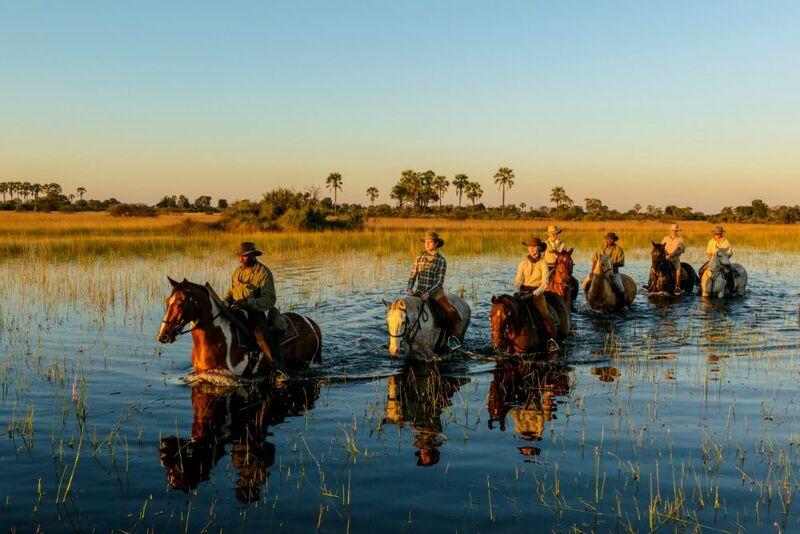 There is no better way to savour the Okavango Delta and experience its unparalleled wildlife population than on horseback. 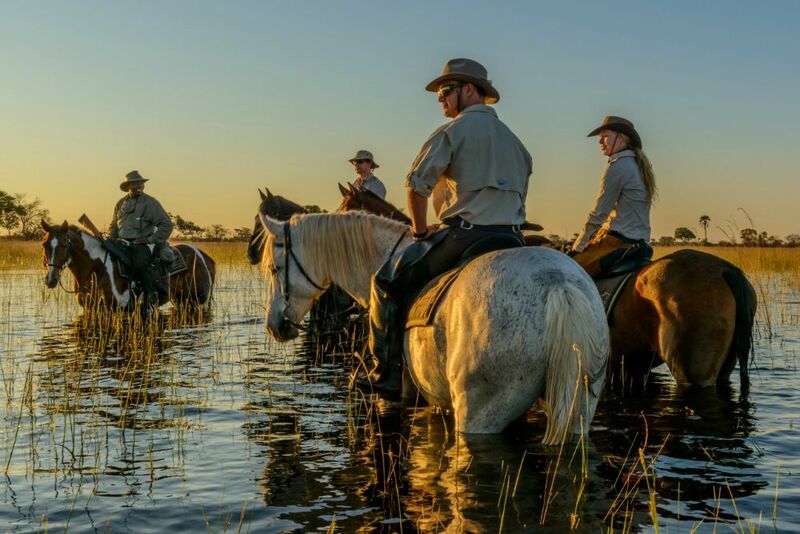 The annual flooding of the area leaves vast swathes of the Delta inaccessible to vehicles, making horses the most natural and exciting means to explore this amazing area. You will be met at Maun airport by a member of our team who will assist you with transferring onto the small plane (either a Cessna 206 or 208) that will fly you into camp. 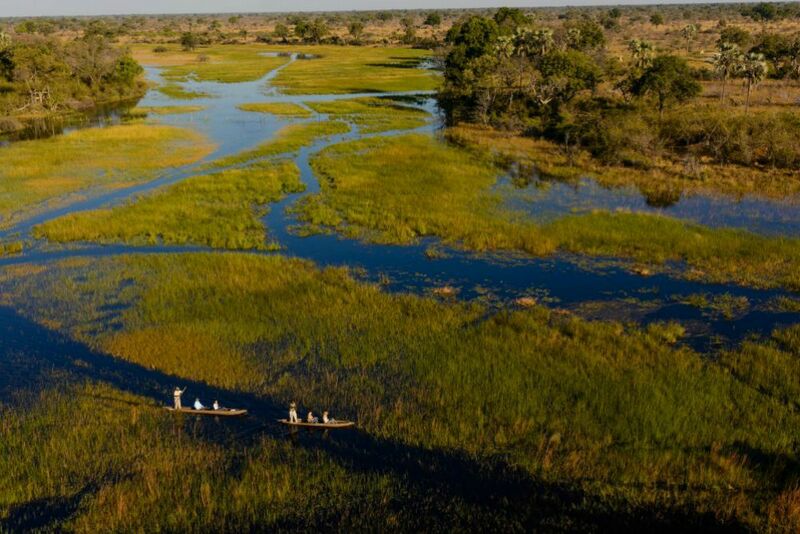 The flight takes around 30 minutes and offers a bird’s eye view of the Okavango Delta – it is amazing how tiny the breeding herds of elephant look from the air! A safari vehicle will be waiting for you at the camp’s airstrip for the 45-minute game drive – or an exciting boat ride (depending on the time of year) – to Macatoo Camp where staff will greet you with a welcome drink. After settling into your tent, you will be offered afternoon tea and homemade cake during a briefing from your guide before heading to the barn for a ride. The pace of the evening rides are deliberately slower giving you the time to enjoy the sunsets and make the most of the photo opportunities offered by the birdlife and game. After a hot shower and change, drinks and snacks are served in the comfortable mess tent ahead of a candle-lit dinner by the fire. Macatoo’s cheerful “tent ladies” will provide a gentle early morning wake-up call along with your choice of tea, coffee and rusks that are served to you in bed. A light breakfast is set up around the campfire ahead of the first long ride of the holiday. There are a wide selection of horses in our barn and Macatoo’s experienced staff has the knack of putting together great horse and rider partnerships. Depending on the season, the morning ride may involve some galloping across dried flood plains, swimming through flood waters, or pushing-on through seas of tall grass to watch giraffe, zebra, antelope, elephant, buffalo – whatever is out there. A hearty lunch is served every day – you will need it after all those miles in the saddle – the chicken pie is a firm favourite and wine is always offered to encourage a little nap before tea and the evening ride. Sundowners are often enjoyed out in the bush before heading back to camp to freshen up. Dinner is always a great occasion at Macatoo, but there is no guarantee that it is always eaten in the same place. After listening to the dawn chorus over tea, coffee and rusks in bed, you will have shaken off any first day riding nerves and be eager to get back on a horse. Heading off in a new direction, the landscape will be quite different to yesterday offering fresh game viewing possibilities. You will be feeling more confident with the ‘going’ and we can speed up the pace a bit – keeping up with some of the large moving animals, such as giraffe or zebra. After lunch, the camp pool is an ideal place to cool down, or stretch the muscles that are feeling the effects of the time in the saddle. 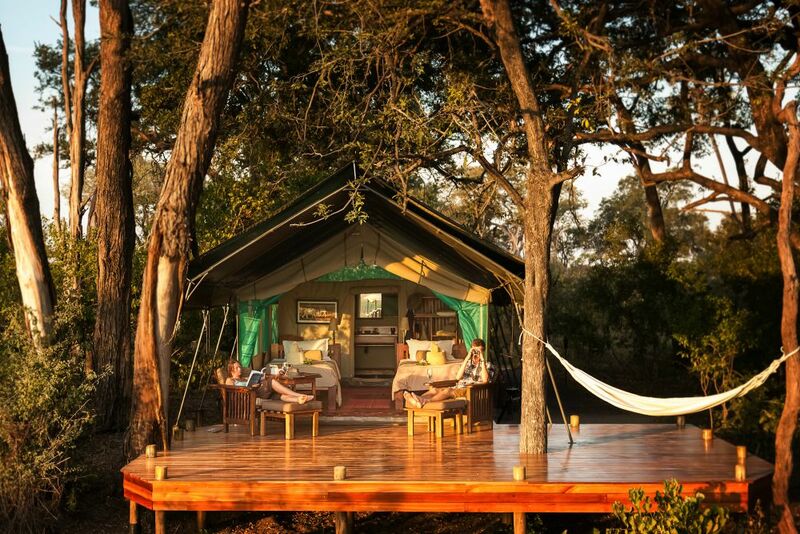 The deck is a great place to soak up some sun, read and doze, but keep your binoculars and cameras handy as zebra, buck and elephant frequently pass in front of camp. The swimming pool is also a popular watering hole for families of baboons, the babies on their mother’s backs are particularly cute. 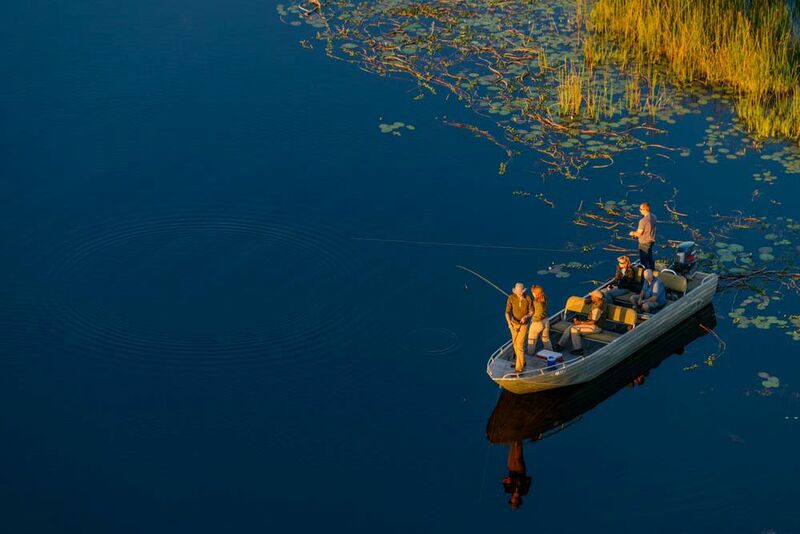 After some lovely homemade cakes or scones, evening rides can be swapped for some sunset fishing from boats, or from the banks of pools where hippos wallow. You will have to be quick about reeling in your bream, before the kingfishers and African Fish Eagles steal your catch from right under your nose. A game drive, accompanied walk or boat rides – depending on the time of year – are also available for those wanting time away from the horses, or for non-riding partners and guests. We ride through different country, making our way through clouds of bushman hair grass to plains dotted with fig trees. We might encounter giraffe or shyer antelope while passing through mophane woodlands. Our pace increases as we break out onto the flood plains, often disturbing troops of baboons. Return to the camp for an afternoon spent at leisure, or the possibility of hiring a helicopter for an hour to gain access to remote and otherwise totally inaccessible parts of the delta with spectacular photographic results. Finish off the day with a night drive by spotlight, where the resident clan of hyena are often spotted. Bushbabies leap from branch to branch through the terminalia and acacia trees – only seen by the brights of their eyes. If lucky, the spotlight will pick up the glint of a leopard’s sultry stare. If we find lion on the drive or know where they are – perhaps we might have seen them earlier from horseback (and avoided them!) – we can spend quite some time watching them from the safety and comfort of the vehicle, over snacks and drinks, as they wake up from their long afternoon rest, groom each other, and prepare for a night of hunting. It is always such a highlight of the holiday to see a big cat – we will have lots to talk about around the dinner table that night. This morning we ride deeper into the heart of the delta, to corners of the wilderness where vehicles simply cannot reach – horses can get much closer to the big game. We cross high palm islands which offer great sweeping views of the Delta plains – are those anthills or giraffes in the distance? 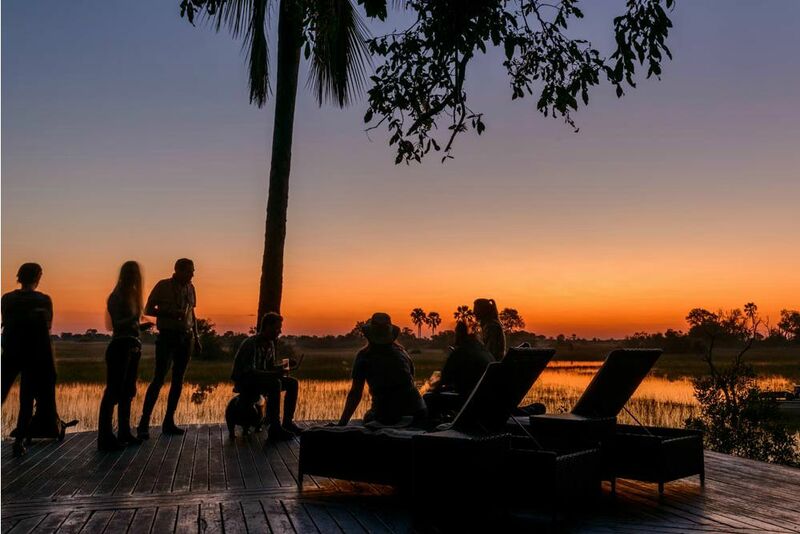 Riders may have joined non-riding friends and family for a walk, drive or boat ride – but all guests will reunite for an unexpected champagne breakfast under a large baobab tree to swap ‘survivor’ stories from the morning. By now, you will have settled into the wonderful rhythm of camp where great adventure, creature comforts and downtime are combined to provide a break. 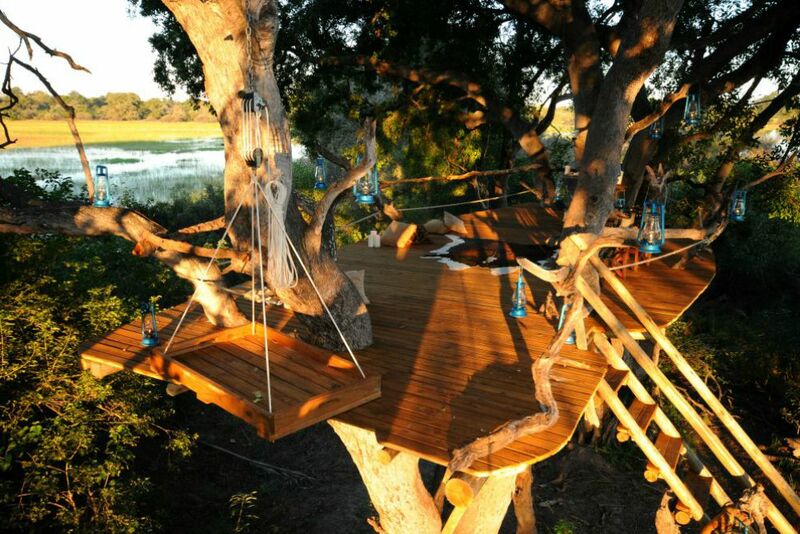 After tea and a gentle sunset ride, you may find yourself at our fabulous tree house where you will have the option to spend the night out, sleeping high up in the tree canopy under the African night sky. From there, it is fascinating to watch and listen as the birds and animals prepare for night – by roosting, travelling or preparing to hunt. 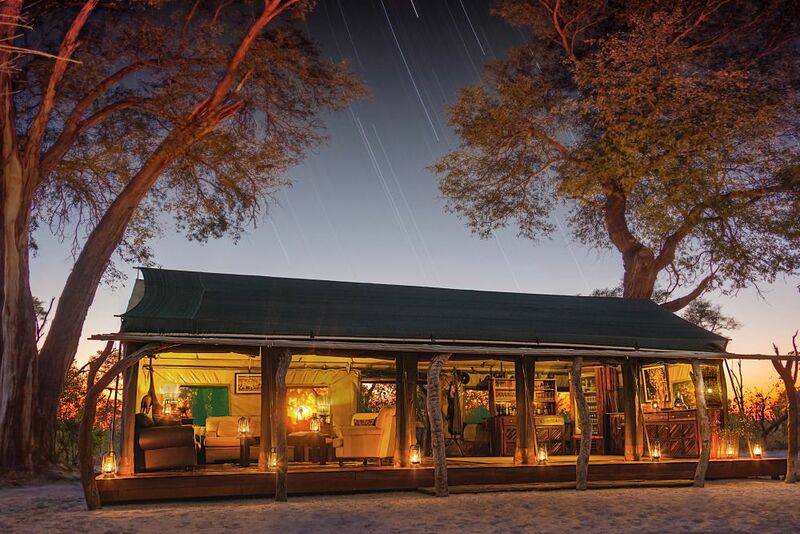 The barking of baboons and calling lions provide an unforgettable soundtrack to a night out under the stars. Your guides will stay too, providing great company and peace of mind – for many guests, this is a real highlight of a holiday to Macatoo. 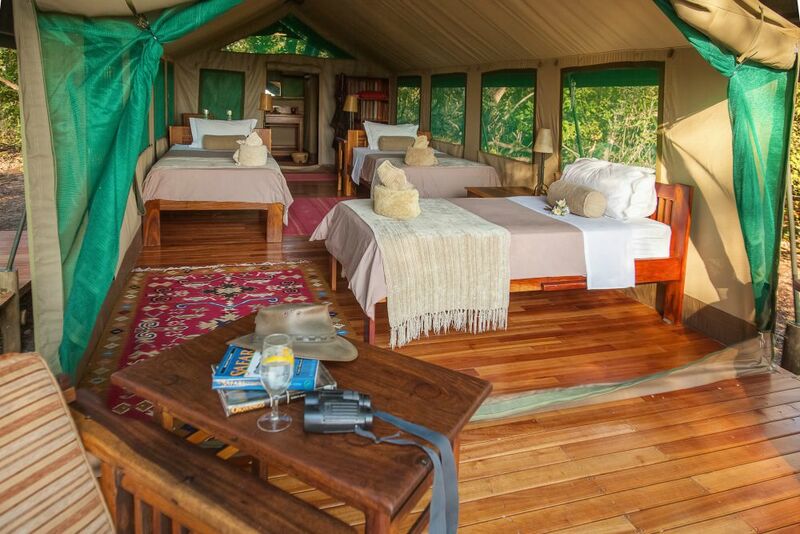 After waking up in the treetops, you are whizzed back to camp by vehicle to change before riding off into new terrain. 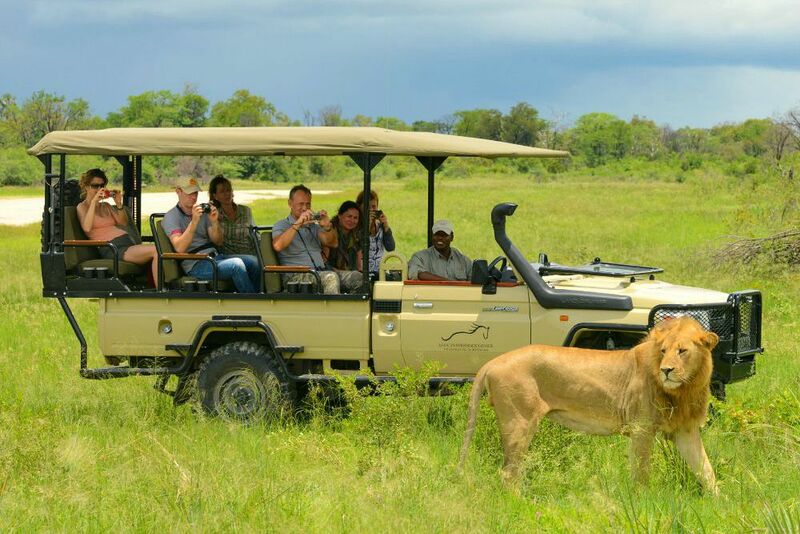 By now, you will have seen most of Africa’s Big Five and riding alongside moving giraffe, antelope and zebras will have become a thrilling, almost daily activity. Make the most of a bush breakfast, or lunch out in the bush and savour the sights and sounds around you. An afternoon by the pool sees many guests desperately trying to even up their ‘farmer’s tans’ – brown arms and face, pale bodies and legs! You may feel torn over how to spend one of your final sunset outings – an evening game drive with a spotlight is often fun, picking up a local clan of hyena, or lions out on the hunt. Above your head Bushbabies leap from branch to branch through the terminalia and acacia trees – only seen by the brights of their eyes. After last night’s treetop sleepover, – a prompt bedtime will most likely to be the most popular after dinner activity, as we save our energy for the last full day and night. Don’t forget your pocket camera today. Store it carefully because things could get rather wet! We will explore the shallow and deeper flood plains; they look so pretty, scattered with flowering lilies. The reflection of the trees – and your horse – will provide great images to capture. Many of our horses love to eat the lilies as they wade – sometimes swim – through the water. Here, the Cape buffalo can gather in large numbers (anything between a dozen and 2000 at a time). We have to creep up on them using the islands as cover. You will be keen to review your pictures after lunch, but don’t forget to re-charge your cameras in the mess tent! The evening offers the choice of a game drive, fishing or a last quiet evening ride with the by-now familiar smell of wild sage and the warm African dust as the sun goes down, transforming the skyline into a cocktail of oranges and reds. Dinner will be a memorable one, perhaps with another surprise location on the cards. The dawn call of the African Fish Eagle has, by now, become as familiar as the morning alarm at home. The delivery of tea or coffee in bed heralds the start of your last morning in camp and you will be anxious to make the most of your final ride. We stay quite close to home, splashing through water on the vast open plains, home to blue wildebeest and Burchell’s zebra. The riding pace will be deliberately quite fast as we cram as much fun as possible into the final hours – be prepared to get wet as we approach deep reedy areas full of bird life including open-billed storks, squacco herons, slaty egrets and Egyptian geese. You will return to Macatoo along the myriad of waterways lined with large trees, before arriving back at the barn where you say a sad farewell to your horse. 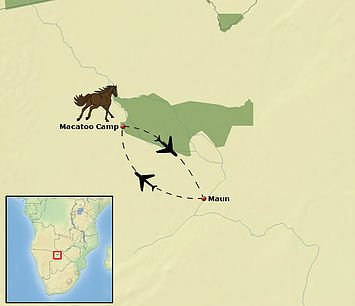 There will be just enough time to shower, change and pack before the game drive to the airstrip, carrying a picnic lunch to tide you over until your return to the real world. Macatoo’s string of horses are as well looked after as their guests. Each horse – they are all boys – are recognised and appreciated for his unique ability and personality and every effort is made to match him with the most suitable rider. Our guests rotate between two or three horses during their time with us to ensure that each animal is given time to recover between rides. We have Thoroughbreds, Namibian Hanoverians, Percherons and Kalahari-Arab crossbreeds ranging between 14hh and 18hh (140-180cm). 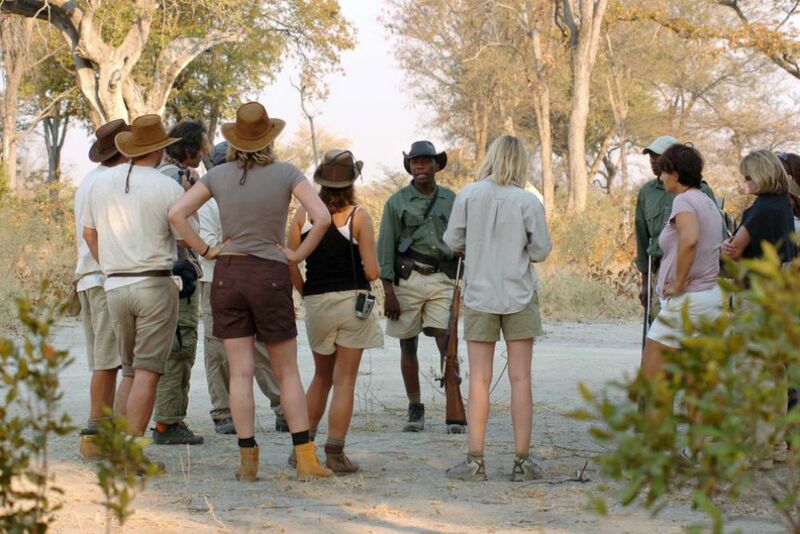 Game walks and game drives with a qualified guided in the heart of the Okavango Delta.